Why did Jesus say, “Mary has chosen what is better”? Wasn’t Martha’s hospitality a spiritual gift? Q. I’ve always wondered why Jesus said that Mary sitting at his feet listening to him was “better” than Martha working to fix a meal for him and his disciples. Wasn’t that an important and needed form of service? Isn’t hospitality supposed to be a spiritual gift? My understanding is that this was an informal occasion–travelers entertained spontaneously in a home along their route–for which a basic meal would have been sufficient. It was not a wedding or similar occasion that called for elaborate preparations. The “main event” was simply having Jesus in the house and having the opportunity to converse with him, and that was where the emphasis should have been placed. But Martha apparently wanted to go “above and beyond” what the situation required and put on a really fancy meal. 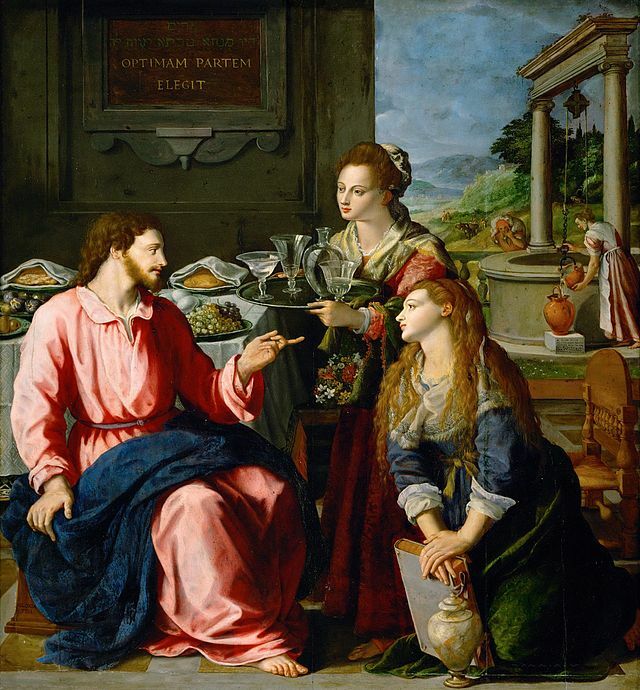 In fact, she wanted to do far more than she could do alone, and so she asked Jesus to tell her sister to help her. I think Jesus was saying, “It’s one thing if you want to go ‘above and beyond,’ that’s your choice, but you can’t also choose it for someone else who wants to give her attention to what should be the ‘main event’ here.” In other words, when simple will suffice, if you want to do more, that’s on you, not anybody else. And Martha eventually did get to host a more elaborate banquet for Jesus and his disciples. She did this to celebrate the resurrection of her brother Lazarus, whom Jesus raised from the dead. (Now that called for a full celebration!) So Martha’s gift and ministry of hospitality did find a place for its appropriate expression within the life of the community of Jesus’ followers. I hope that those today with the same gift and ministry will find and be given similar opportunities, but also that we will all recognize when an occasion calls for something simpler and a different focus. I really like this explanation. Thanks. Previous Previous post: Why did the disciples head off across the lake without Jesus? Next Next post: If the Bible isn’t scientifically accurate, how can it be theologically accurate?